Can you display specific categories on a page? My classifieds consist of horses for sale and stallions standing at stud. They are organized by discipline with stallions as a subgroup under the discipline. Is there a way to have horses for sale to display in one page and stallions only on another page? Right now they all appear mixed together. The subcategory (and the one I want to list on page) is Stallion with an ID of 36. Now if I add another level like category Cutting (ID 15) with a subcategory of Stallion (ID 45) again, how would I list those? No worries! 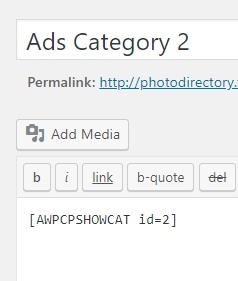 I've taken a screenshot of the shortcode as I've entered it in WordPress -- the shortcodes get expanded here in the forum, so I can't past it here. For the second one, I am getting clarification from the developer, as I don't believe the docs are very clear on that right now! I'll get back to you once I know more. Thank you, I've got it working. Now to figure out why my photos in the show ad are all pixelated and blurry. They look perfect in the ad. I'm glad you were able to sort out the shortcode issue (the answer was simple - to use the ID of the subcategory!). I did as you said. Turned off all plugins and tested. Still the same. Changed from Twenty-Fourteen to Twenty-Eleven. Same problem. Site is http://www.salehorseresource.com. It's perfect until you click on Stallions ... which is the category selection discussed above and it's putting the photos across the entire width instead of how it's done with Show Ads. Another thing that wont easily adjust is the width of the table. It is so wide it goes into the 3rd column and you cant select the pricing option because it's under the stuff in the right column. Thanks for trying that. I don't seem to be seeing the same things you are, so I'm wondering if this is a cache issue. You could be seeing old data on your browser (this happens a lot when you are making lots of changes all at once). We recommend clearing the server cache, if you have one (which is found either in your hosting settings or on your plugin settings for things like WP Super Cache and W3TC if you have them installed), as well as your client browser cache. The best way to get uncached data on your browser is to use a Private browsing window or Incognito mode (depending on your browser). That ensures you're seeing the latest, correct data. Yes cash has been cleared. Here is the page I'm having trouble with from the private browser. See how the stallion pictures are all blurry and fit all the way across screen. If you click on them you will see that the photos are good resolution event clicking on them to make them larger. This is where I'm having the table issue. Both work and look great on tablet and mobile versions. It's just on the pc version. Thanks for that information. Can we please get WP admin and FTP credentials to your site to look into this further?